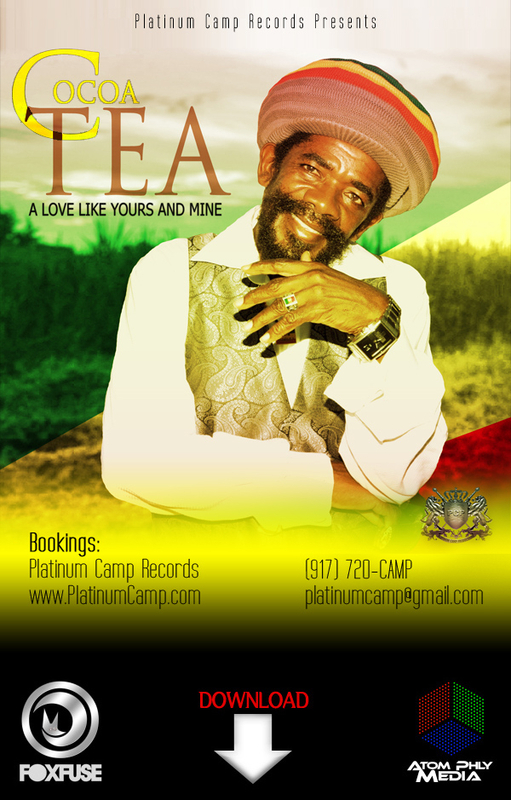 Platinum Camp's Reggae ambassador, Cocoa Tea, is booked for the 2012 Olympics in London, England. The only reggae artist requested to sing for the Queen and the entire world. When asked if he was prepared to meet Her Majesty, his only response was, "I'm ready and waiting." Not only is he ready to meet the Queen but he's also ready to meet the world press. Cocoa Tea's new single "A Love Like Yours and Mine" is about to hit the world stage. This song is about a tender love story, which is said to be one of his finer works among hits like, "Rikers Island," "Informer," "18 and Over," "I lost My Sonia," and "She Loves Me Now," to name a few. His song "Obama" became a hit and a favorite for the Obama campaign and among the Kenyans during the '08 elections, and he is once more geared up to go back into the studio to record another song for the upcoming 2012 election, as well. Cocoa Tea is currently preparing for his Summer Tour that kicks off on June 26 in Brooklyn, New York and continues on to Boston, Portland and Seattle, to name a few of his stops. As a man from humble beginnings, Cocoa Tea is known for his charitable works and his tireless efforts of giving back to the community to help to alleviate suffering. We wish a long life and Good health to this pillar of strength.